So basically the hardest part was modifying the Blueshawk bridge (same as the Nighthawk bridge) to be able to pass the strings through to a B5 style tremolo.. Drilling the bridge plate was very tedious, as the new holes had to be very close under the old ones. Also the Vari-Tone switch head had to be modified as it came too close to the tremolo dive arm..
No roller bridge needed, not too much angle going over the bridge..
Great job! The guitar looks awesome! My first whammy bar experiment was on my Explorer, then came my 55 LP Std Pro, with its C profile neck turned out to be a very stable platform for a tremolo and because of its sculpted top the widest range tremolo action. 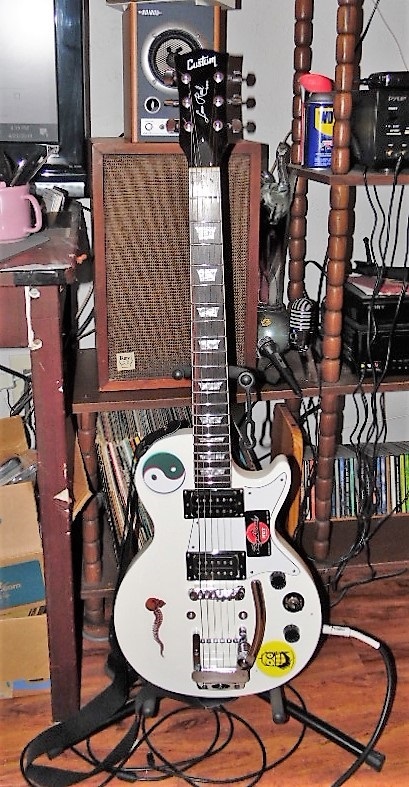 Then I acquired a cherry G400 added humbucker sized P90's a roller bridge and a Les Trem II, this is where my trouble started because it worked so well it became my guitar of choice, also the stock black plastic nut works the best for equalizing string pressure. My white 61 SG got jealous and found a Stetsbar designed to use just the 2 studs of a wraparound bridge. My favorite guitar the Epi Blueshawk had way too much dust on it , so I had to find a cure. Anyway 3 Les Trem's, 1 Stetsbar and 1 Duesenberg Tremola Short, later... The Duesenberg Les Trem II's were the easiest to install, quality built, non destructive, cost effective and most important of all best reaction range. With the bar set in max dive position it will make contact with the body before the spring is fully compressed getting about a full octave down. The Stetsbar is amazing, smooth as glass, bridge moves with the tremolo, lots of versatile adjustments but also the most expensive. In the cost range of an FRX. 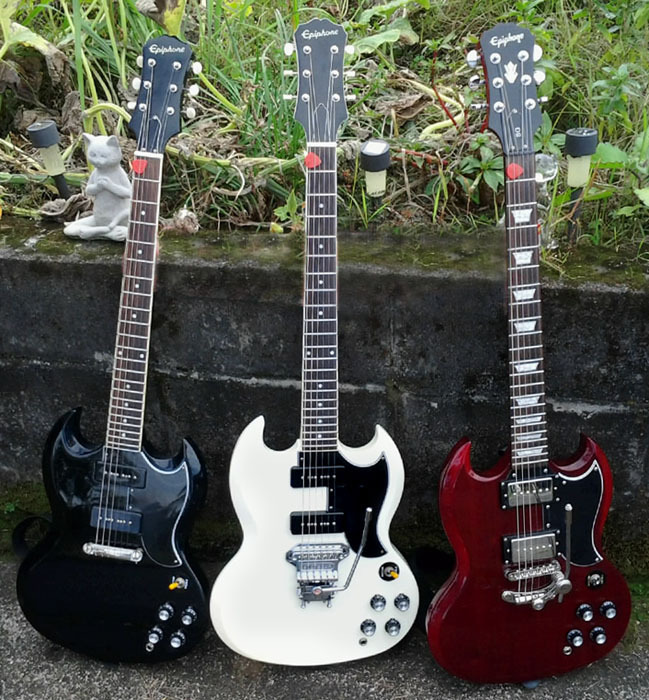 Note there is a signature Britt Lightning Epiphone SG with an FRX coming soon.. Note the Bigsby B5 would have worked about the same for the Blueshawk/Nighthawk as the Duesenberg Tremola Short..
My Epi Blueshawk is once again my most versatile all around Guitar and with a 25.5" scale neck..
Are you in the US? 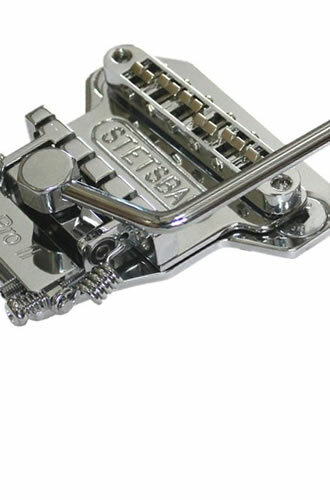 Where can you get those Duesenberg Tremolas in the US? Whenever I google them, I only see them available in Europe or something. And is a Stetsbar a direct drop-in fit for an Epiphone wraparound bridge, like the wraparound bridges on Epi Special Is? I live in Hawaii, all of my Duesenbergs came from Europe. I got one through Reverb that actually came from Rockinger Gutars in Germany, but most I bought on ebay, 2 of which came from a store in France, I went with best price and shipping.. Shipping was very quick, in most cases about a week..
One of the mods I have seen a lot on old Gibson Juniors and Specials with a wraparound bridge, is to add a hardtail tremolo still using the old bridge drawing the strings over the top going to the tremolo. 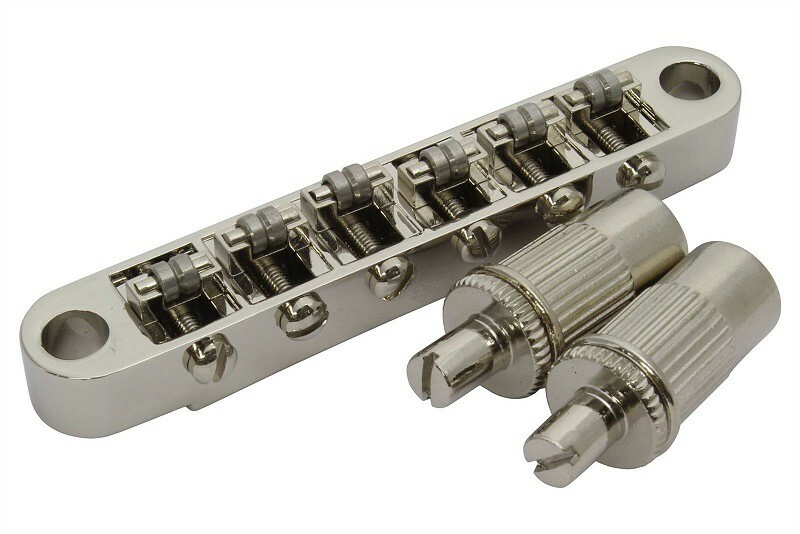 GuitarFetish also has a wide range of Bridges, Roller Bridges and Bridge Hardware.. Thanks for the replies, mihcmac, I appreciate it. Dropped right in on existing posts. I used one of those TOM roller bridges from Philadelphia Luthier Tools as well on my G400 project, working quite well..
A new Duesenberg USA site is coming up, as well as their prices.. The cost of a new Les Trem II has been raised to $150, some old stock is still available on ebay at lower prices, but going up. I just bought a new one best price came from Australia.. The Tremolas cost $200, but @ least they’re available in the US. The Tremolas cost $200, but @ least they're available in the US. 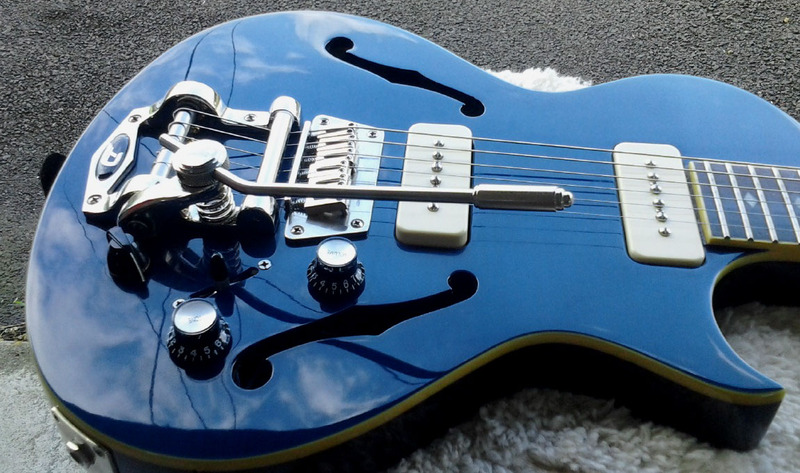 I got the Duesenberg Tremola for about $160, off ebay, that I thought was a lot at the time.. My Blueshawk is my favorite guitar and really wanted a tremolo solution for it..
Looks pretty good how do you like using it? I think it might have less string travel than the Duesenberg Les Trem I have on my Samick V and the Bigsby B7 I have on a Hohner hollowbody, But i’m getting more and more used to it. I had to put a penny under the 1 1/8” spring (the tallest spring you can get for Bigsby-type trems) to make the bar less close to the body. Some people put a washer to raise the bar, but i’ve found that a penny works, too. I think it might have less string travel than the Duesenberg Les Trem I have on my Samick V and the Bigsby B7 I have on a Hohner hollowbody, But i'm getting more and more used to it. I had to put a penny under the 1 1/8" spring (the tallest spring you can get for Bigsby-type trems) to make the bar less close to the body. Some people put a washer to raise the bar, but i've found that a penny works, too. Have you compared the Duesenberg spring to the Bigsby B7 spring? Wow, those Goldos look exactly like the Les Trem IIs. I guess Duesenberg doesn’t have a patent on their Les Trems. I didn’t compare my Les Trem’s spring with the one on my Bigsby, because I don’t have a problem with the vibrato bar on either of them being too low. I did have that problem with the XTrem, and it already comes stock with the tallest Bigsby spring available. If they do carry those types of springs in hardware stores, I wonder if one taller than 1 1/8” would be stable? There must be some reason why you can’t get regular Bigsby springs taller than 1 1/8”. Wow, those Goldos look exactly like the Les Trem IIs.